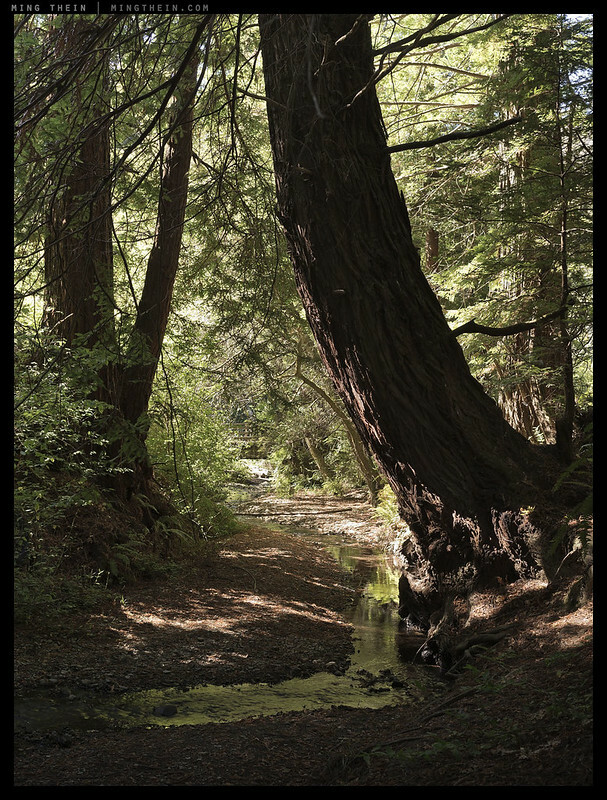 At the end of last year, I spent an enjoyable day with Lloyd Chambers in the Purisima Creek Redwood Park about two hours out of San Francisco; being from a much more tropical part of the world, it was my first experience photographing in this environment and this subject. 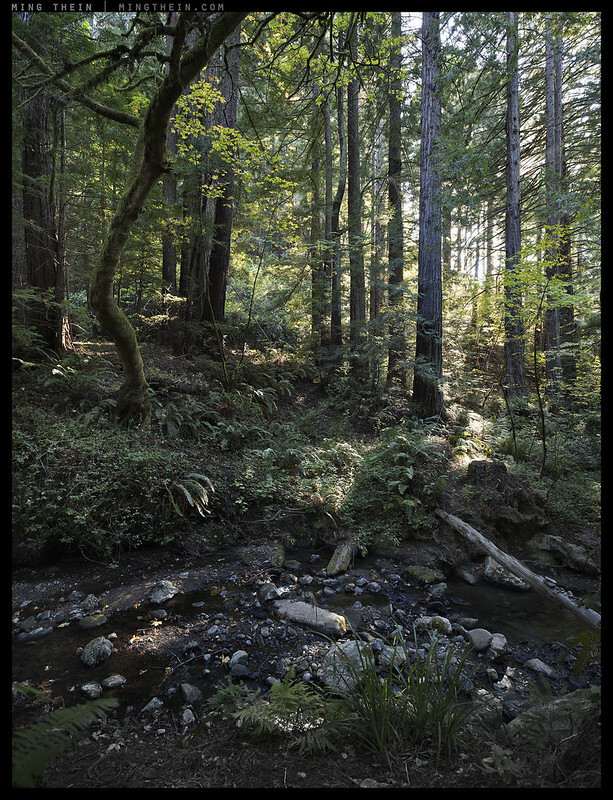 I have to say the very pleasant company, comfortable temperature, lack of people and generally clear forest floor made for a very enjoyable afternoon – and more importantly, one that was conducive to making photographs. Being rather new to landscape then, I didn’t appreciate two things at the time: firstly, the presence of a clear vantage point of a stand of trees with some intermediate space between yourself and the subject; secondly, a range of easily-accessed height perspectives to avoid having to use much shift for vertical correction, leaving the shift axis to be used for stitching instead (three frames on a D810 yields about 70MP). Finally, the kicker: it was an extremely still forest, with almost zero wind. 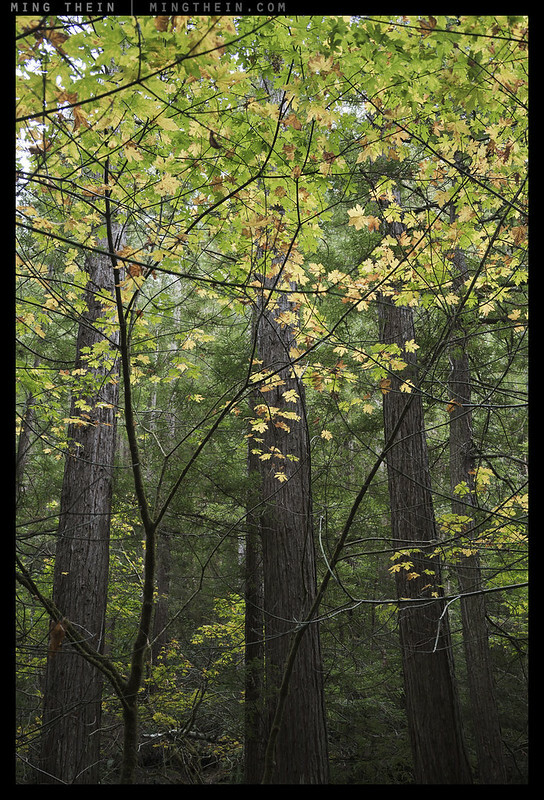 This means unlike a lot of other forests I’ve been in, stitching is not only possible, but very easy – even with the very finest leaves and branches. Since embarking on the Forest project* in earnest, I’ve since come to appreciate just how much of a difference even the slightest breeze makes – a little gust halfway through a row of stitches can mean start again if you’re still there, or throw everything away afterwards. I also experimented quite a bit with a much more vertical presentation – I think it could work with the right subject, but I haven’t found it yet. Those classical Chinese painters were on to something. 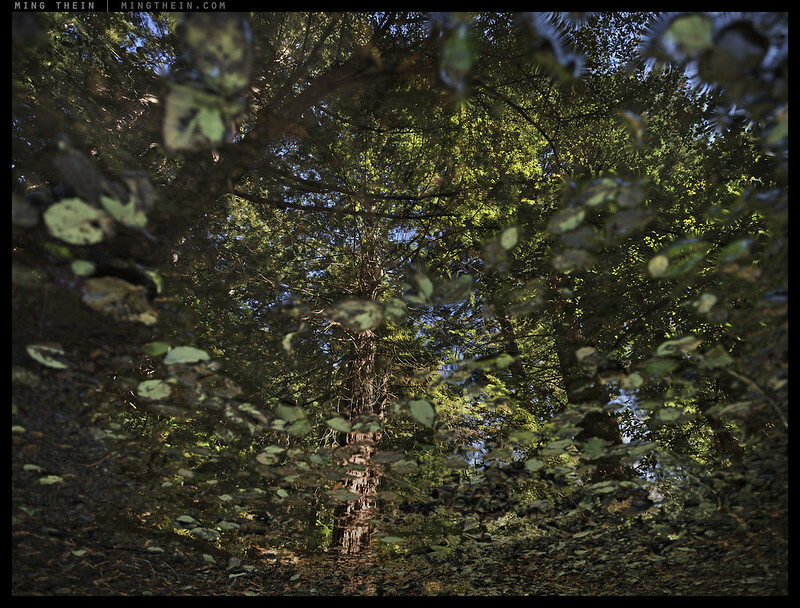 Oddly though, I found the stillness was the most difficult aspect of this particular forest to capture: there’s this sort of primeval silence and weight that you feel when you’re there, and I think can only really adequately be translated through the key of light and deep saturation of the final image. Of course, the images were intended for Ultraprinting. There’s simply no way any current digital display medium can convey the full information captured, much less a small web jpeg – for a lot of these images, you’re looking at less than 0.5% of the total information captured. Quite a lot is bound to be lost in translation, including Flickr’s unavoidable sharpening algorithms. Please bear that in mind when viewing. The photo with the Bigleaf Maple leaf is my favorite among all which you posted. I enjoy water and reflections quite a bit. 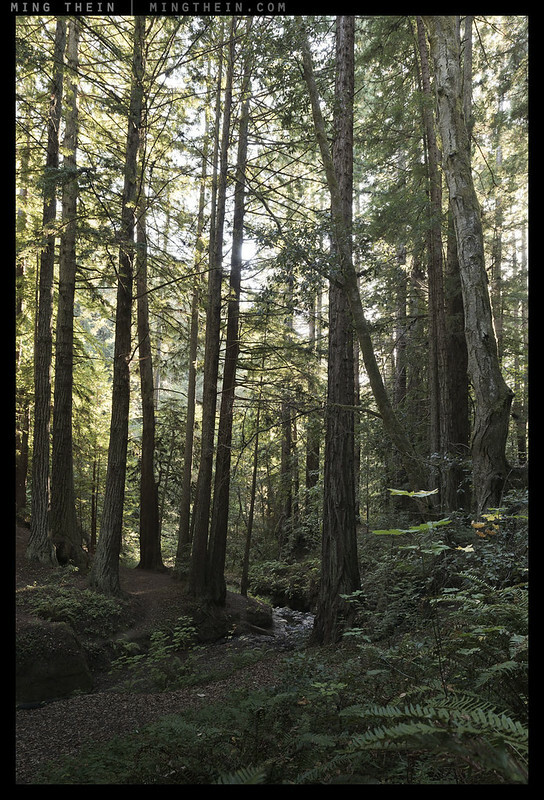 Maybe we will cross paths in the northern redwood coast someday. Correction to previous <> – it should be “the BEST of it” – D.S. Ming – I’ve been meaning to say this to you for a long time… Your compositional sensibility is often surprising me. At times I think of whether this is the result of you being immersed in the Eastern aesthetics as opposed to many of us, “westerners” – I don’t know the answer. One example of what I see is your use of out-of-focus foregrounds. You tend to dance on the verge of somewhat-out-of-focus, which I find utterly distracting. A viewer’s brain is struggling to make sense of what it is looking at, and it is not finding certainty. The result is – unsettling feeling, destroying the intent – to convey serenity of the scene. Your use of 43 equipment has been contributing to the “signature” rendering, but lately you are using large sensors, yet this rendering style is still there. I understand that you are stopping down a lot attempting to squeeze more depth of field out of those serious lenses, yet the true balance of sharp versus out-of-focus is rarely there. “Bokeh” has become an overused term, but, still, you are not making the beast of it, and of your premium optics’ ability to “paint”. Please, take no offense. Enough is the fact that I’ve been long gathering enough steam to tell you about my take on your imagery. Besides, I have learned a thing or two from your site, and look forward to more posts. All the best to you! Wonderful work. 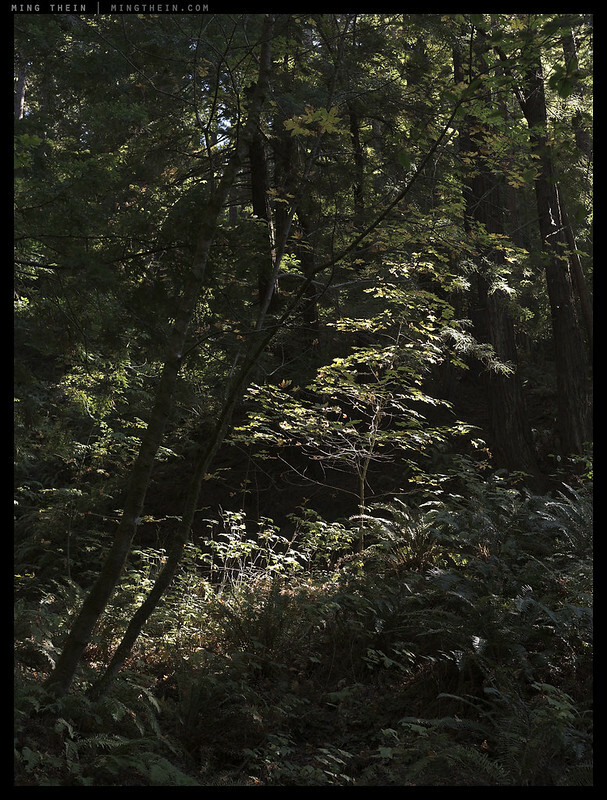 The hardest thing (for me) about shooting trees in a forest is getting separation–both from the camera to the subject and the trees from each other. You have managed it. My fav is the one where trees are converging on the top (_8B05944-5 copy). Lovely pictures. Wow, excellent set. “_64Z4249 copy” is superb. Lovely, Ming. The second shot (leaves in the foreground) is superb. Really cool! I love how it was taken! 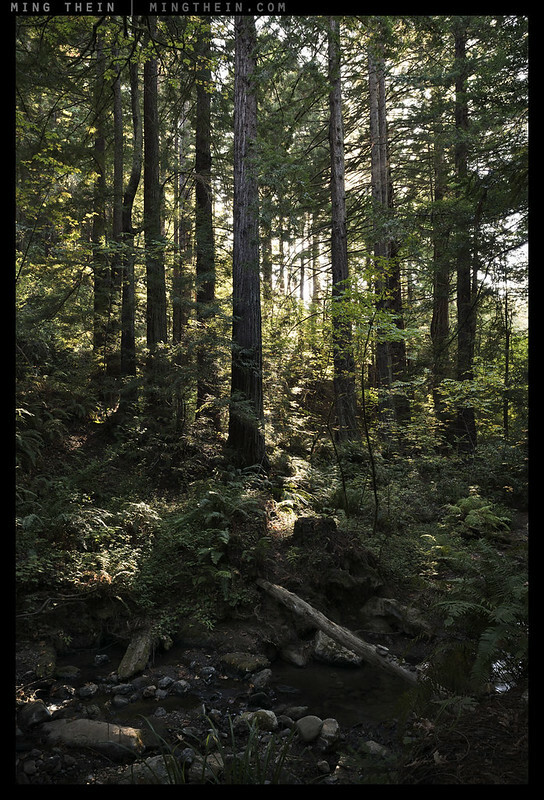 It shows the beauty of redwood forest! I’m not much of a landscape fan, but I am emotionally struck by forests/ trees. And I have to say, yours are among the best tree shots in colour I’ve come across. My favourite is the converging trees in square. Also, how long did it take you to find the composition for the floating leaf? 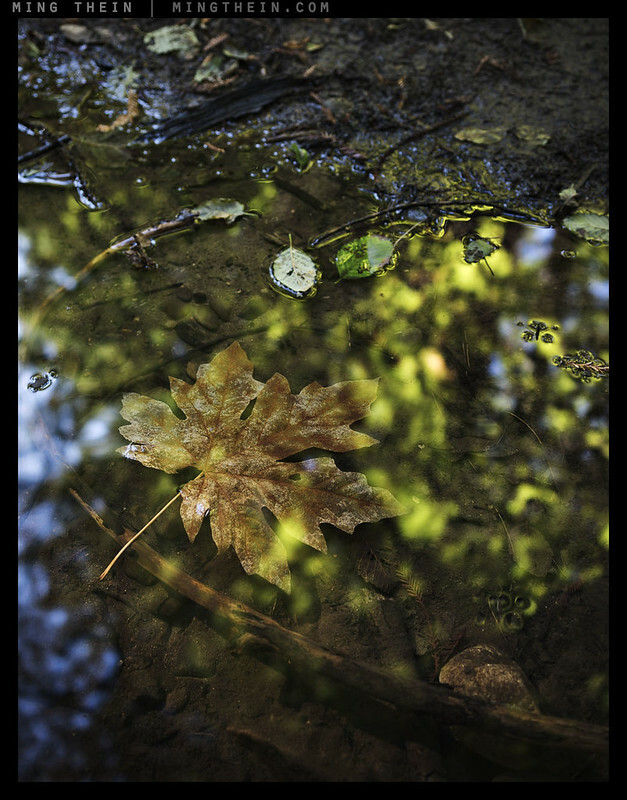 Hard shot to do without making it look like a simple snapshot of a floating leaf, but – as usual – you managed. Can just echo the other comments. Very nice work and you are – again – on to something with the vertical photographs. I like the old Chinese paintings and have thought about how one could replicate it in photography. The ones I’m thinking about are often very compressed, but yet they are landscape drawings so they still cover a fairly wide view. I have never ventured into stitching but I imagine stitching a good amount of telephotos could do the trick, am I right? Something you aim to try? Thank you – yes, it’s probably only going to work with very long teles to achieve the same perspective. very striking use of vert pano! it is an interesting format to be sure. three medium sized prints arranged side by side could be awesome. no kidding? i bet that looks cool. I was going to say that the panorama’s felt a little “foreground heavy” composition wise, but makes sense if the intention was to have them sit as a triptych.That being said, that perspective might also be different when viewing them in print individually. I think its also impacted by the subject in this instance. The rational for this type of photography (detailed nuance) is literally lost in translation. self around just the girth of the tree and height of that enormous living thing. There is something magical about them and as a photographer probably very challenging about capturing their majesty and essence. Lovely interpretation. Could you elaborate on this “a range of easily-accessed height perspectives to avoid having to use much shift for vertical correction”? Now that I own one of the amazing photographs you show us here I can just confirm how poor the web versions are. The depth and 3 dimensional look of the Ultraprints are often questioned by people here *Which 3-D camera was used here? * They are surprised to learn it’s just a high quality camera, a good lens and some careful stitching that were used. *Have you shot that picture? * To which I have to reply *I wish I had*. That’s a fantastic looking set Ming! I’m now curious about this human perspective thing. 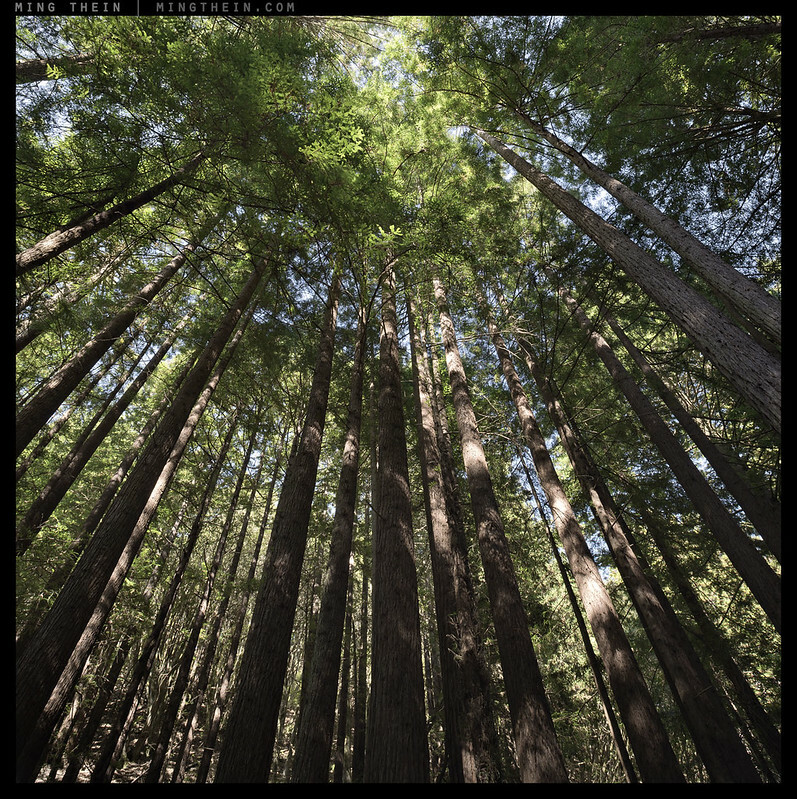 I’ve been shooting trees this weekend with shifted perspectives to try to emphasize the vertical lines. Nice shots, I like these compositions. 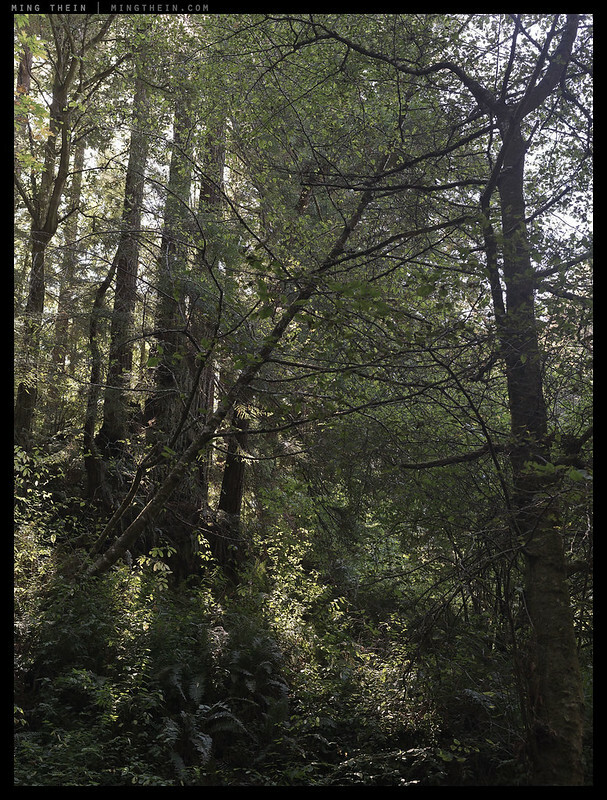 The Coastal Redwoods are maybe the hardest of the giant trees to do justice to, as getting a true sense of scale in next to what are the tallest trees on earth is usually impossible. So you work with what you have and I like the way you handled this, lots of form and lots of lead in foreground. If you are in the region again, the best two places for these trees are probably 1. 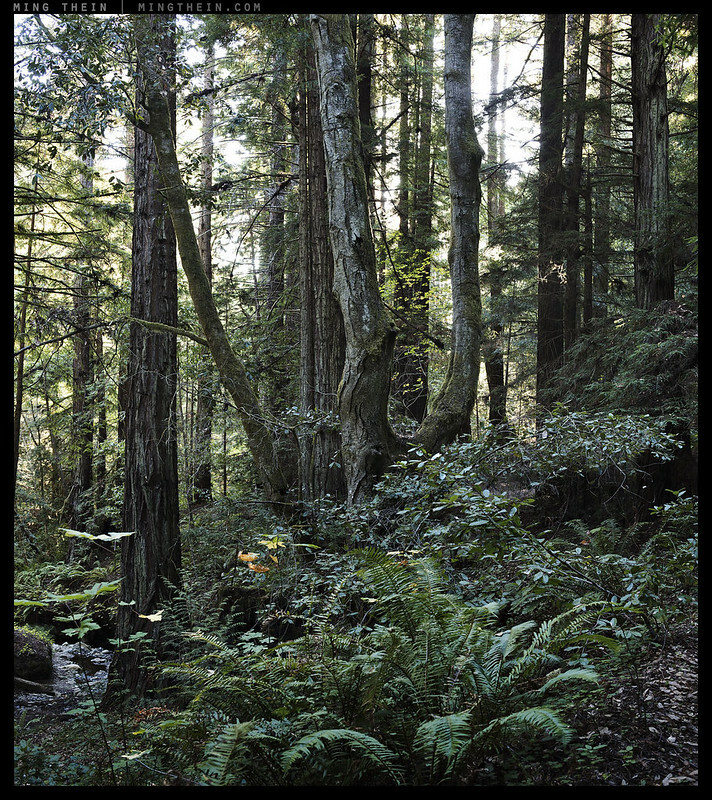 Stout Grove at the very NW of California near Crescent City and Rockefeller forest, Humboldt. 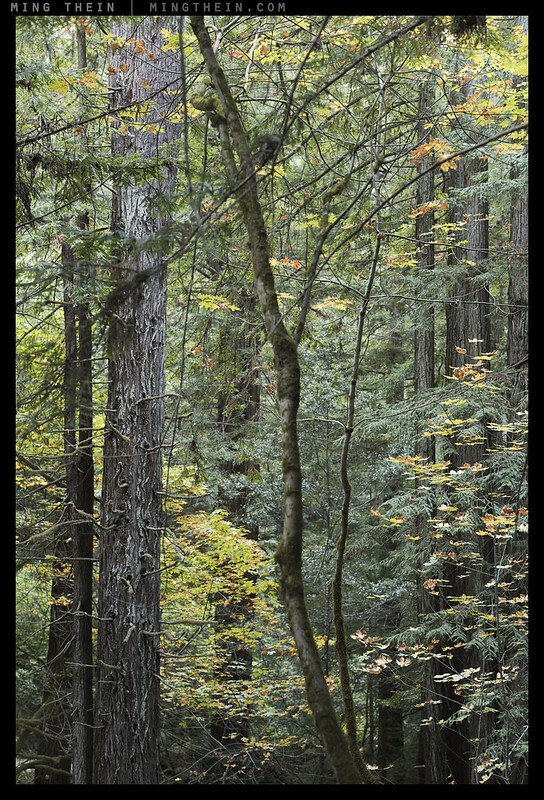 Stout Grove may well be the most impressive forest I have ever seen, even against Sequoia or the Bristlecones of the White Mountains. What Neutral-GreY said. We in the Bay Area are happy that you and your gear found the beauty around here. Please come again, love your images, they are amazing, always. Hi Ming, The way you talk I’m surprised that you don’t shoot large format film. Have you considered that? 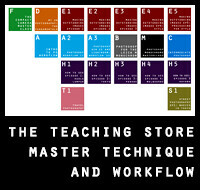 It would also allow you to use a lot of movements, which could also be useful in your architecture work. Very nice portfolio. 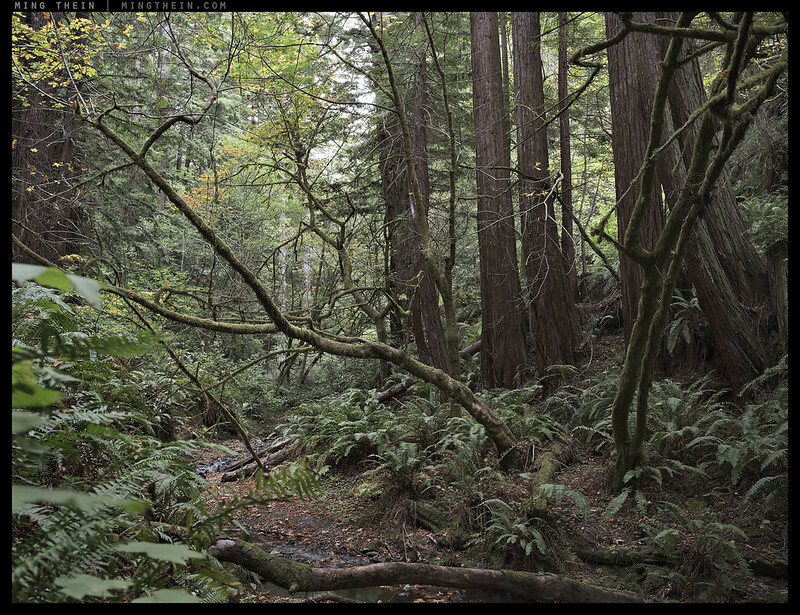 I’ve been shooting the woods around the Bay area of years and it never gets old and it changes every day. But you are right in that the spirit of place cannot be captured. What the eye see, the sounds, the stillness… it is all part of the ambient environment and what attracts me, but pictures are only part of the narrative. It’s lovely to see my corner of the world through your lens. Nice work!